Some websites may use information about your location in order to display information that is relevant to you, such as the weather, traffic, or a map. For example, if you allow a website that specializes in restaurant reviews to know your location, it will suggest reviews of cafes and restaurants near you. Your location is determined by the nearest wireless access points and your device's IP address.http://ru.wikipedia.org/wiki/IP-%D0%B0%D0%B4%D1%80%D0%B5%D1%81 For more information, see How Yandex determines my city. Attention. 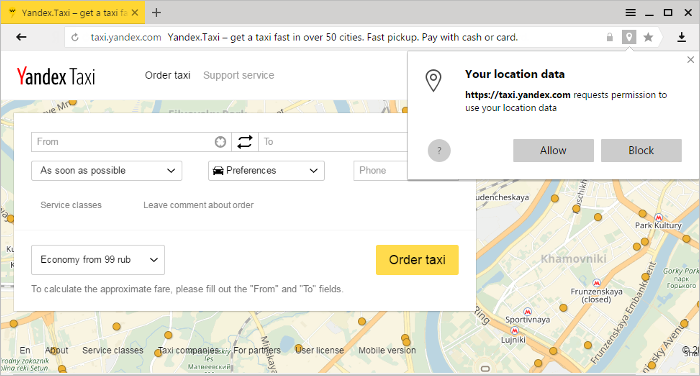 Yandex Browser will never transmit information about your location without your permission. Device location data is depersonalized: only geographic coordinates are sent (not information that could be used to identify the user). If a site requests information about your location, you will be notified of this at the top of the page. Information will not be sent to the site unless you click Allow. If you gave permission to transmit your location to a website or one of its components (such as a map), the icon will appear in the address bar as a reminder. Click the icon to see detailed information or revoke access to your location information. In the Location section, click Manage exceptions. To remove a site from this list, click . The website will no longer be allowed to detect your location. In the Location section, select the option Do not allow any site to track my physical location. Note. Your manual city selection is saved in a cookie file. Regional settings will work on your device until you change them or delete your cookies. Go to the location settings page. Turn off the Auto detect option. Enter a city in the field and click Save. If you can't save the city, make sure that cookies are enabled in your browser. You might have installed an extension that changes your proxy server settings. Try disabling any extensions like this. Temporarily disable all extensions: → Extensions. If your location has now been identified correctly, enable your extensions one by one to find out which extension changes the proxy. Disable the problematic extension. You may want to let the developers know about the problem. Refresh the page to make sure the problem has been resolved. If the problem is not solved, use the Feedback form to report the issue to Support. Send a link to the page where you see the wrong city. Indicate what city is listed in your settings when you click Find me, and also indicate what your actual location is. It's possible that you prevented all sites from tracking your location earlier.